At the Grange, safety is a priority! Rental Agent Merry Shernock decided it was time to keep tabs on the water which comes from our deep well at the Hall, so in January she brought a proposal to the Grange meeting to get it tested again. She had one test done several years ago, and our water tested very well in terms of having no bacterial condemnation at t hat time. This year, she contacted the Dept. of Public Health, and the helpful people there helped her figure out what we should be testing for, as a public building where people drink the water. In the end, we tested for bacteria again, plus for heavy metals and radiation. We also got a radon detector, which is sitting out of the way on a shelf in the kitchen for a few months. We are pleased to report that we are waaay below all the limits on every contaminant. So drink up! There is no excuse to not keep your body hydrated when you are at the Grange Hall! 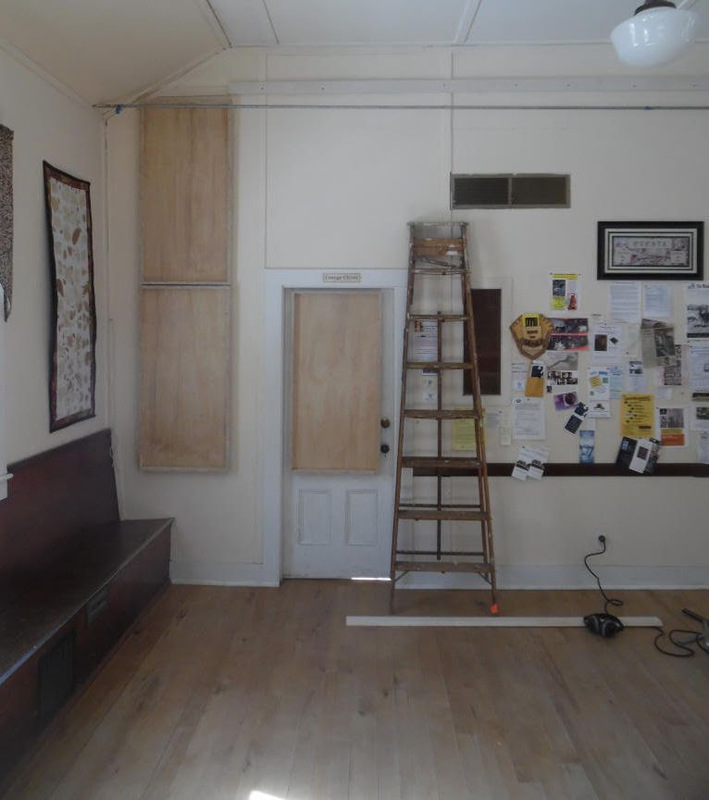 On February 23rd, an enthusiastic crew of volunteer did final assembly on and hung 18 acoustic panels, 24″ x 48″ on the south wall of the Grange Hall, opposite the stage–see the picture above. These panels, filled with rockwool acoustic pads 2″ thick, and covered with fire-resistant, acoustically transparent fabric, are designed to reduce “reverb”–the echoes that can interfere with hearing clearly in the Hall. What do you hear? That’s what we want to know! Now that we have about 1/3 of this wall covered with acoustically-absorbent panels, is there a change in the sound quality of the Hall? We’ve heard from the BarreTones, the women’s barbershop harmony singing group that rehearses in the Hall that they can’t yet hear much difference. At the CDU dance on Mar. 2nd, a number of people reported “some” difference, especially near the wall with the panels, opposite the stage. We’re hoping that this reduces the “reverb” of our notoriously “live” Main Hall. We want to hear from people who use the Hall for a variety of purposes–dances, meetings, church services, singing, instrumental music, and more. We’ll reach out to various regular users, and also want comments from everyone who uses the Hall. Email Tim at grangepresident@capitalcitygrange.org , or Patty, at FCCGHVT@gmail.comand let us know how it sounds to you. We’ve got 6 more panels we can hang in the Hall, and we’re ready to build more, and hang them in other parts of the Hall if these do what we hope they will. 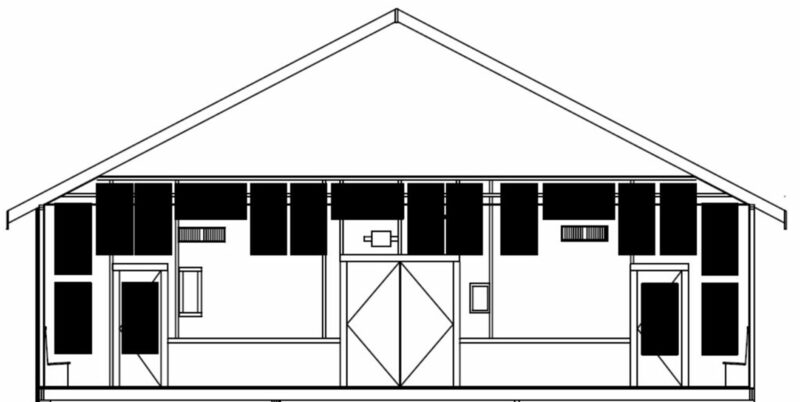 The Friends of the Capital City Grange Hall is now looking at plans to add panels on the side walls of the Grange, putting panels above the windows and between them. This will more than triple the square feet of acousticly absorbent panels on the walls. We expect this to make even more difference, obviously! 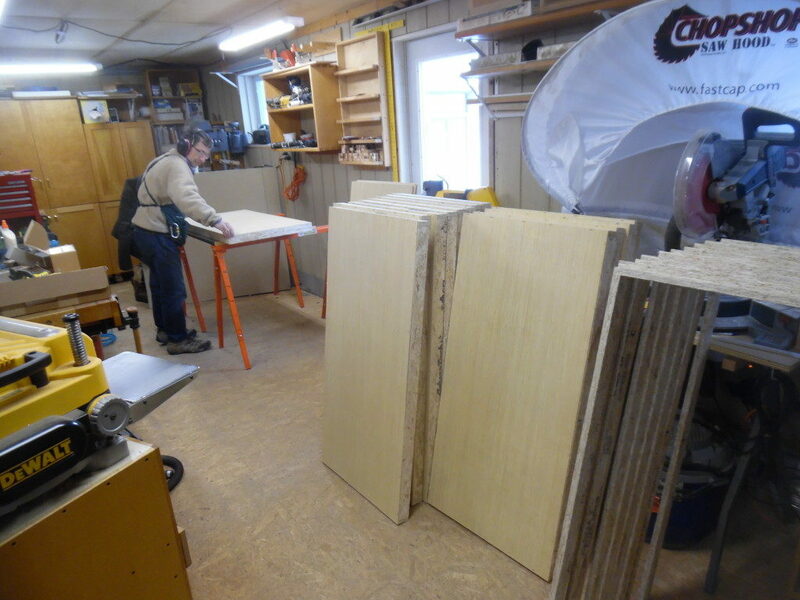 We’ll post info about when we’ll do our next work-day to complete panel assembly, covering with fabric and hanging on the walls when we have it set up–stay tuned! We spent a fair amount of time discussing ways to attract more people to active involvement in the Grange. 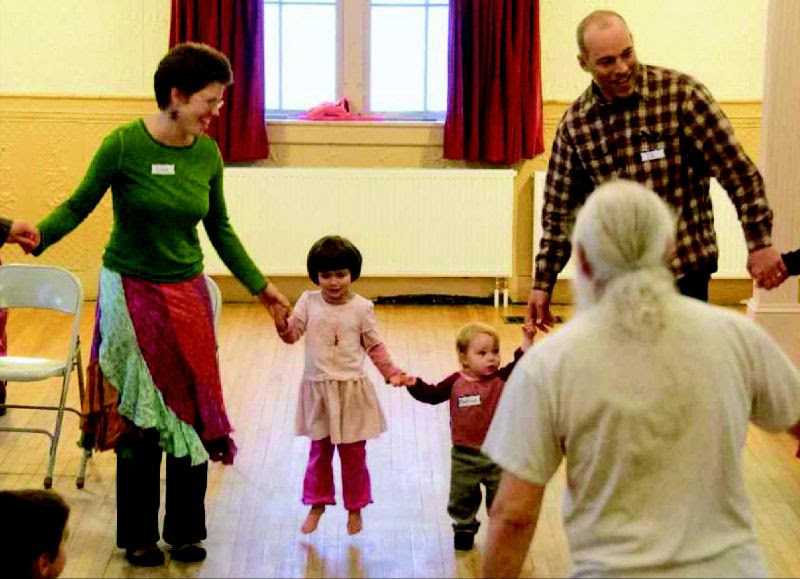 There are–literally–thousands of people who visit the Grange every year for family events, performances, church services, dances, classes, workshops and more. Yet month after month, we have the same dozen or so people sitting at the Grange meeting, enjoying spending time together, and feeling our way through decisions about how to run a Grange in the 21st century. We all like getting together–but at some point we are going to need to get some new folks involved, if we are to keep this outfit going! 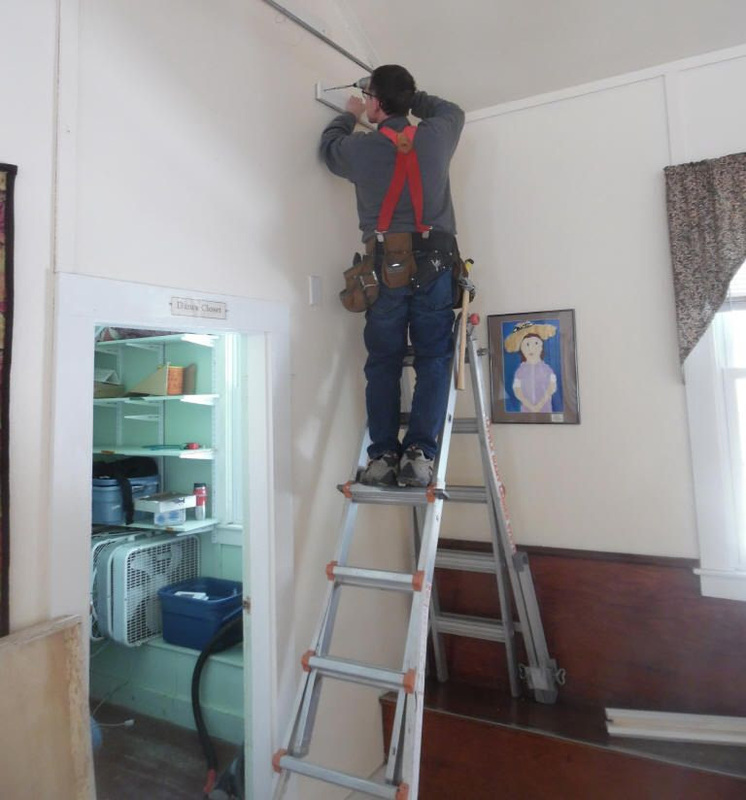 Our biggest asset, of course, is our Grange Hall, and keeping the building in good shape is one of the main ways that people contribute time and money–see for example the acoustic panel installation reported above. 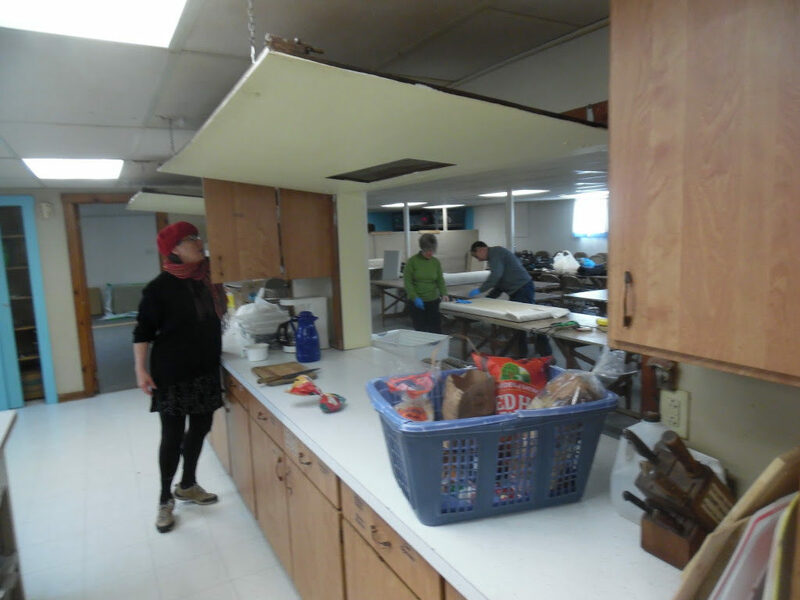 Providing the Hall for use by Berlin community use, and for rental by people from a much wider area has for a long time been a large part of the “community service” which is one of the primary purposes of the nationwide, all-volunteer Grange movement over the last 150+ years. In our area, we offer an attractive (and getting more so), affordable, accessible and affordable venue for all sorts of events–just look at the Calendar. Our monthly meetings are one way to be part of keeping the Grange going. At them, we follow our version of the Grange rituals, which we’ve simplified to speed up the pace of the meetings–no passwords, reduced versions of the 19th century rhetoric–and we’ve tried to combine our business meetings with open-to-the-public programs on a wide variety of topics, followed by a “community potluck”. We’d like the Grange meetings to be events that lots of people are interested in. We’d like to have more people interested in how the Grange works, and in taking part in the projects we take on, and in helping us make decisions about projects to take on, where to invest money, and whom to support. 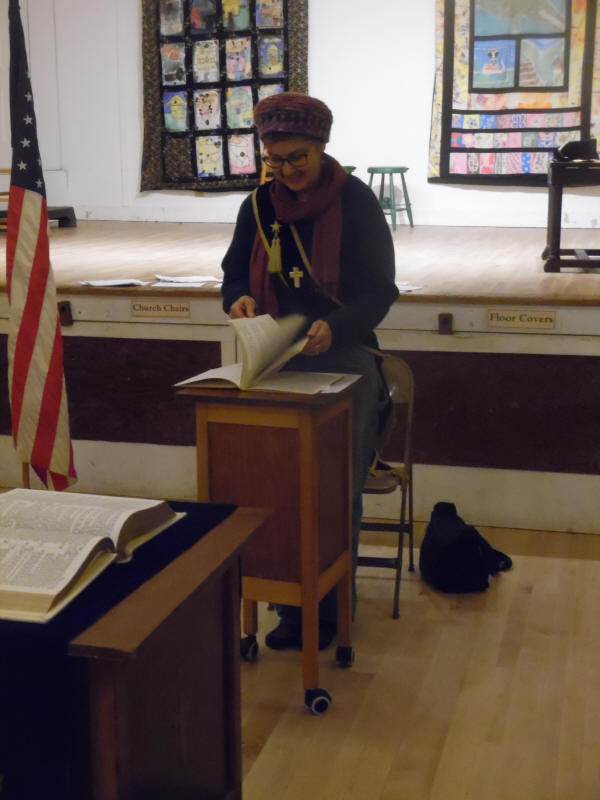 We also recognized that there are a lot of people really dedicated to supporting the Grange and the Hall, who don’t come to meetings–the many people who donate to the Friends, who take part in projects–the acoustic panels are the most recent example, the less-visible people like Tova Cohen, who posts all the CDU contra dances on the website Calendar, and many more. There is also a lot of mostly-invisible work that keeps our organization solvent and running–clearing snow from entrances, communicating with potential tenants, doing the bookkeeping, working with the State Grange to keep in good standing, putting publicity in local media about Grange events, arranging the programs, keeping Grange minute meetings and other records, setting the thermostat for heating the Hall in the winter. At this point, the same people have been doing these jobs for a long time–for decades in many cases. None of us are getting any younger, and some of us would like to get a break. So how do we get people involved in those sorts of work? Part of it could be encouraged if more people came to the meetings and see the work going on, or at least the results. We’d like the programs, also, to be ones that educate Grange members and community members about topics that affect the community–about agriculture (the Grange was started for farmers, after all! ), advocacy organizations, participatory music (sing-alongs! ), and opportunities for involvement in community services. We agreed in our discussions that we think that having face-to-face discussion and interaction add depth that is not available by doing research on the Internet. As our Grange Musician, Mat said, “will it work in my yard?” is a question that can’t necessarily be answered by the internet! 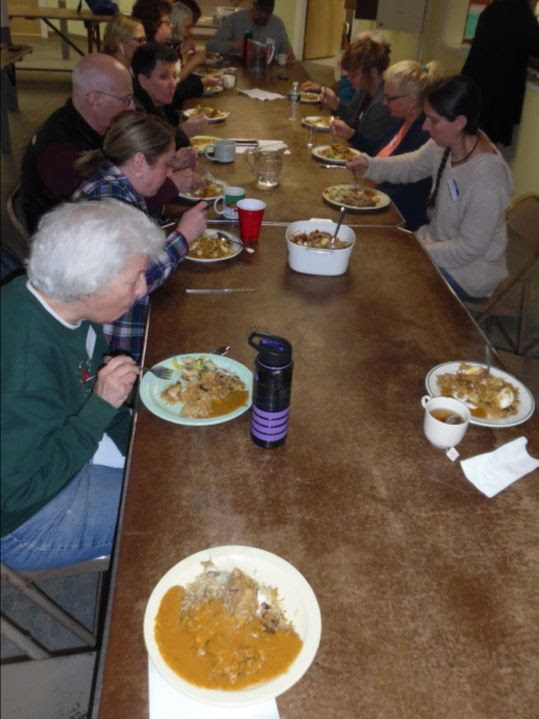 In our experience, we find we are rushing through the meeting and the program, to make time for the potluck before the contra dance set-up needs to start. It’s hard to find speakers who can provide a meaningful program, with time for the discussion and questions which are often the most informative and enjoyable part. The opportunity to do that is part of what distinguishes these live programs from electronic options like looking up a website. So–one firm idea that came up in our discussions of all these issues is shifting to having longer programs in some months, alternating with full Grange meetings. The idea would be to promote attendance at more interesting Grange programs, and having more relaxed time at business meetings to go into more depth. We always enjoy having time for another song together, if we make sure we have the time! 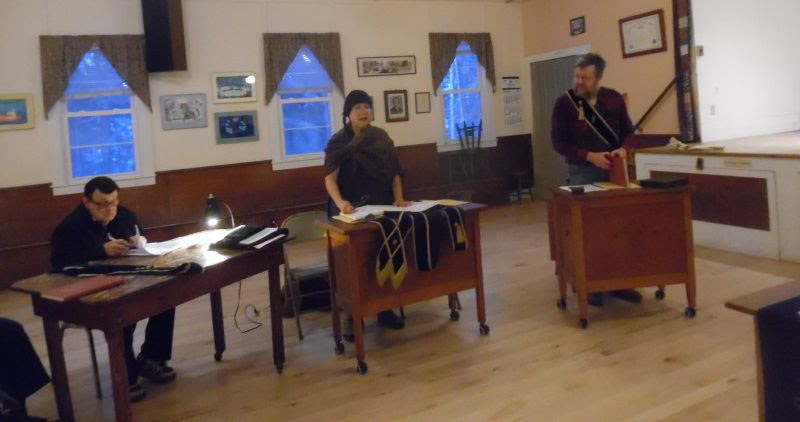 Just as I mentioned in connection with the programs, we continue to believe that having actual, face-to-face meetings adds to the quality of our connection, and to the decisions we make, which in turn keep the Capital City Grange a vital, committed community organization. These notes are just my own take on our discussions–we covered a lot of ground, and I’m doing my best to summarize some of what we talked about. 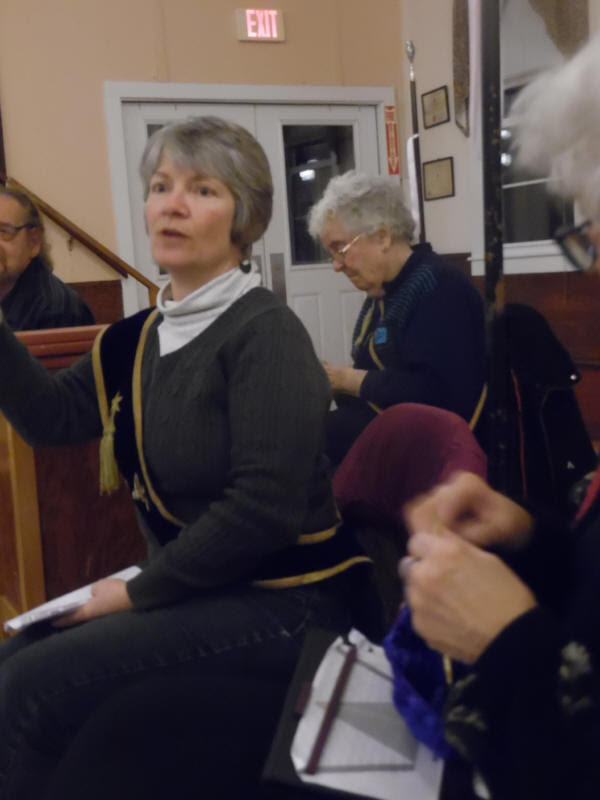 We will be continuing our discussions of these issues, and our ideas about improving our meetings, our programs, and the Grange in general at the April 6th meeting. Please join us and help us figure these things out. We know you are interested in what happens at the Grange–that’s why you have read through this long notes! P.S.–we will continue to have monthly potluck dinners–and we’re talking about having a mid-summer dinner at the Grange–so keep in touch. As you can tell, Grangers like to cook and eat! Traditional Parsi Indian Cooking workshop, next Sunday–few spaces left! 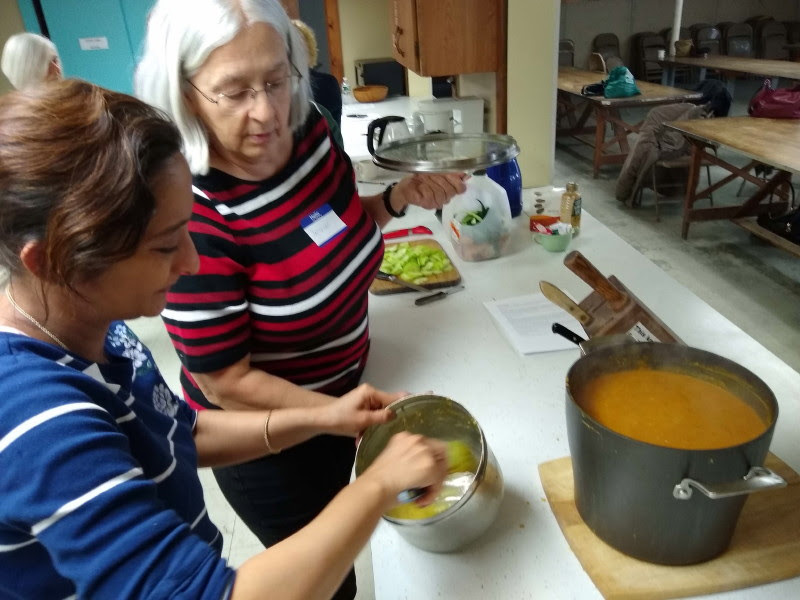 Delna taught some very satisfied cooks how to makes a number of basic Indian dishes last year. Next Sunday, March 24th, she is back to do a more advanced cooking workshop, from 2:00 to 6:00. 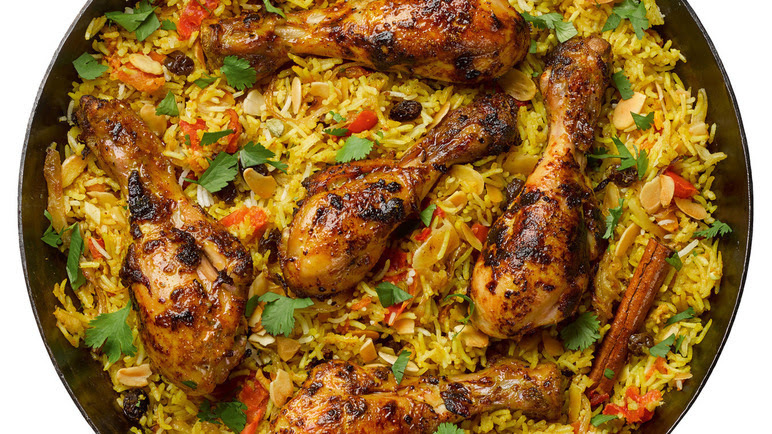 The main dish for this one will be Chicken Biriyani, accompanied by rice, a dal (legume) dish and Kachumba, a vegetable dish. We can only accommodate 12 people for this workshop, so sign up soon to reserve your spot. Send an email to Merry Shernock if you want to be on the list! Suggested donation for this workshop is $20. This will cover all the ingredients and supplies. Come as singles, couples, multi-generational pairs or trios, but get in touch quickly! Those with dietary limitations note: this workshop will include chicken, as you might guess, and also cashew nuts, raisins and dairy ingredients. 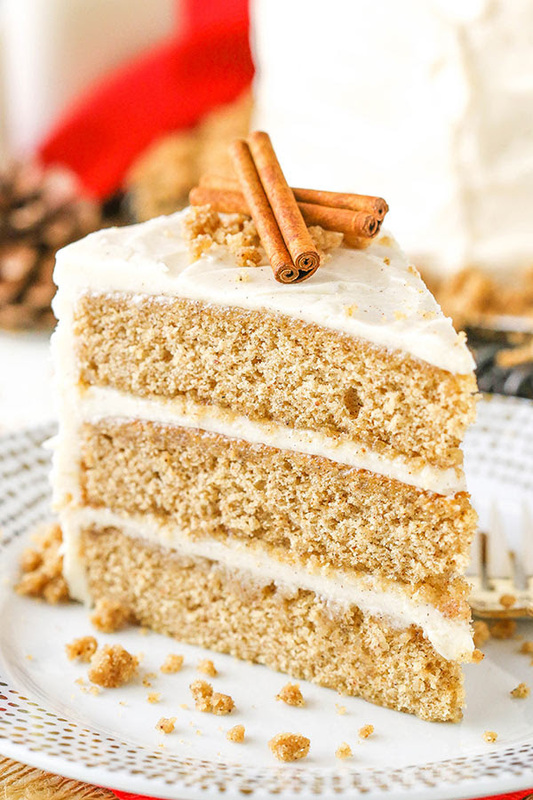 In 2019, the Grange Baking Contest will be “Spice Cake with Cream Cheese Frosting–your recipe”–so it’s time to start testing your favorites. We’ll do the judging at our May Grange meeting, on May 4th. 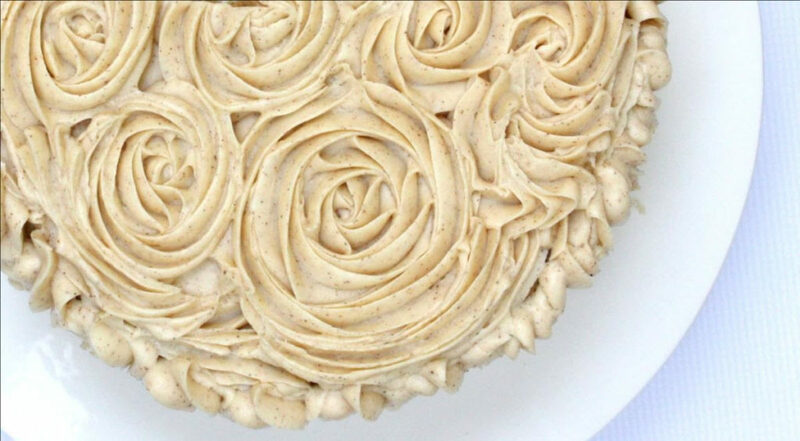 Below are some pictures of spice cakes with cream cheese frosting which I found on the Interweb. What will yours look like? But more important–what will it taste like? What sort of texture will it have? Our CELEBRITY JUDGES will be giving their opinion. Lynn Spencer, art teacher at the Berlin Elementary School, an accomplished baker who has made pies for Elly’s Farm Market, and curator of our Berlin student art displayed in the Main Hall. 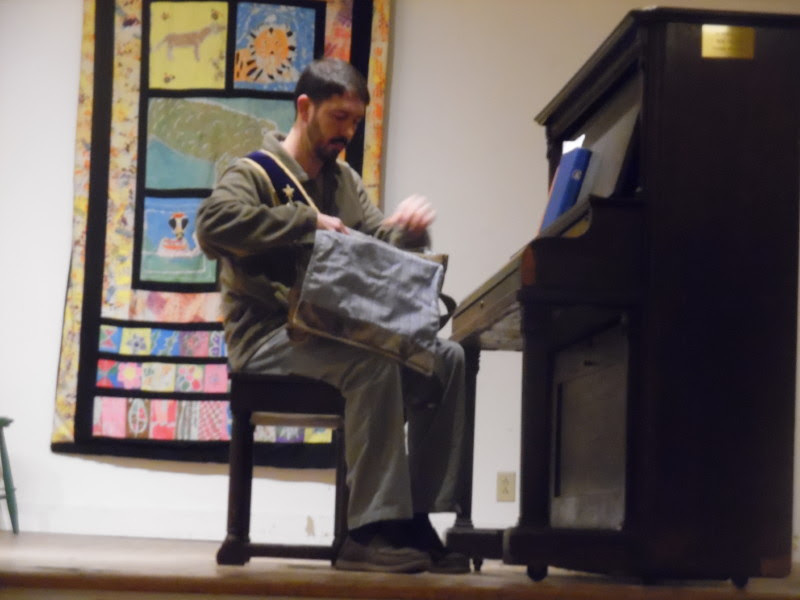 Alec Ellsworth, fiddler and accordion playe, who plays with Katie Trautz in Chaque Fois, plus on his own. Alec is also head of maintenance for Hubbard Park in Montpelier. 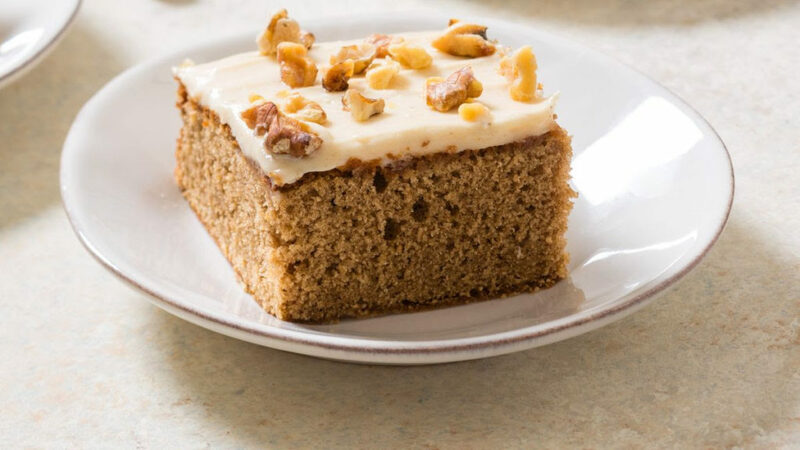 Jacqueline Rieke, aka Nutty Steph, is the proprietor of the central VT granola bakery and producer of chocolate, including CBD-infused products. How are you going to wow this lineup? Thanks to the volunteers who showed up and worked hard on Saturday afternoon, we made fairly quick work of our project. As you will see in the pictures below, we had a good crew, who divided themselves into teams to cut the fire-resistant, acoustically transparent fabric, fill the frames with rock-wool acoustic batts (also fire-proof), wrap the frames, attach hanging cleats to the backs, and then hang them on the wall-cleats. Kurt and Tim had installed almost all the wall-cleats the day before. Our crew included: Patty & Kurt Giavara, Merry Shernock, John & Sue Morris, Mary List-Wheeler, Stephen Wright, Dana Dwinell-Yardley, Nancy Turner & Thomas Weiss! Thanks to all of them. I think that if you talk to any of these folks, they will tell you that it was fun as well as productive to work on a project like this–and we’ll be happy to have more of you readers join us on work-days like this in the future. The Grange runs purely on volunteers working together–an enjoying it. We even provide snacks, which you can see Merry setting out in the pictures below! That’s what we want to know! Now that we have about 1/3 of this wall covered with acoustically-absorbent panels, is there a change in the sound quality of the Hall? 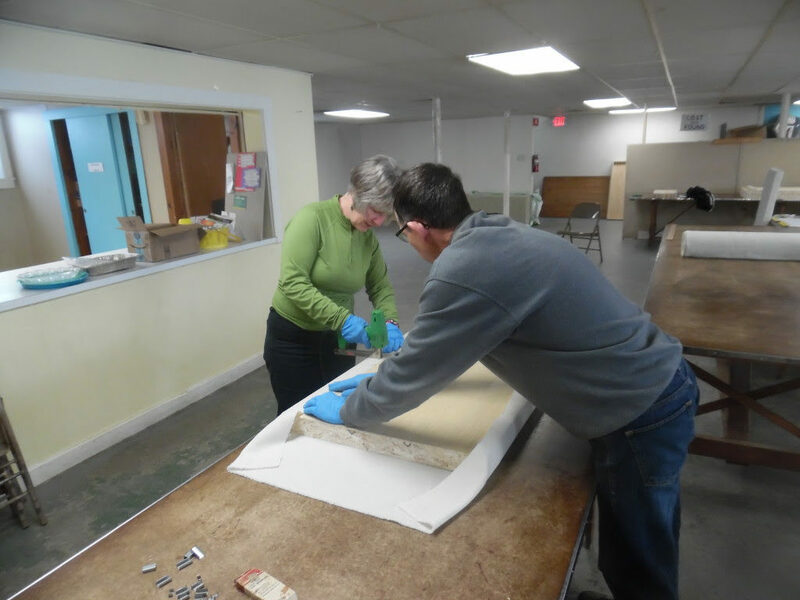 The Friends of the Capital City Grange Hall thank everyone who contributed to the fundraising campaigns which bought the materials, as well as the hard workers who built and hung the first phase of panels. March Grange meeting: join us on Saturday to help us plan ahead Our monthly meeting starts at 4:15 PM on Saturday–we get together to keep track of what we are doing, and to figure out ways of doing it better. Dance, Sing & Jump Around is the family dance for kids & their adults. 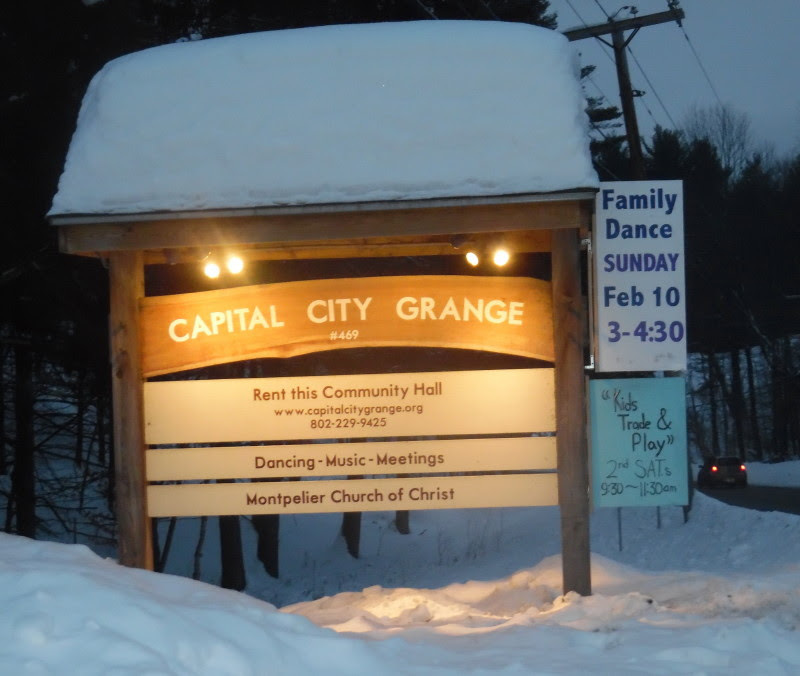 The Grange decided to sponsor this dance as a Grange activity, and first session at our Hall happened on Feb. 10th. About 40 dancers of all ages came to have fun! This is around twice what they had at their original location in Plainfield. More info at their website: Dance Sing and Jump Around. Come by and check out the live music, live calling and fun next time, on Sunday Mar. 10 from 3:00 to 4:30 PM! Kids Trade & Play, the clothing exchange for families continues to draw lots of kids and parents who are happy to come in out of the cold. Stop by on Mar. 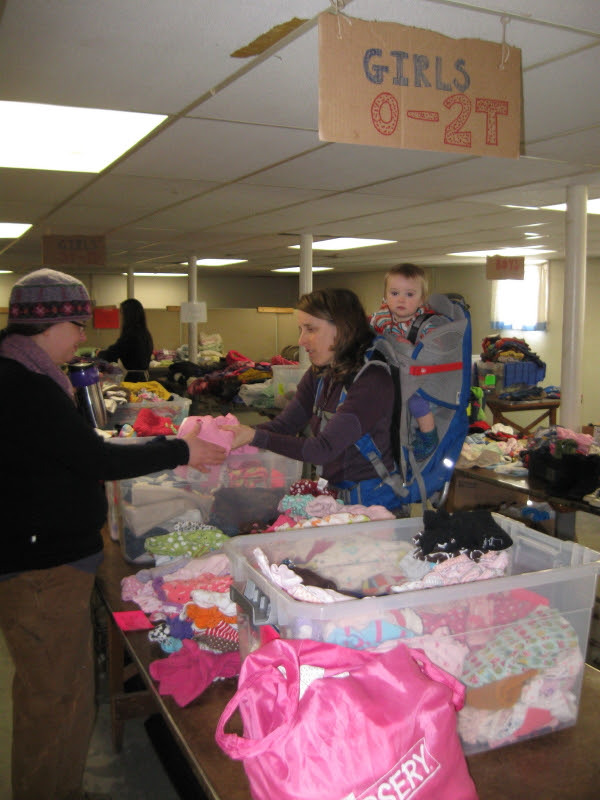 9th, from 9:30 to 11:30 AM to check out the offerings of gently-used clothing, toys and “gear” for kids. 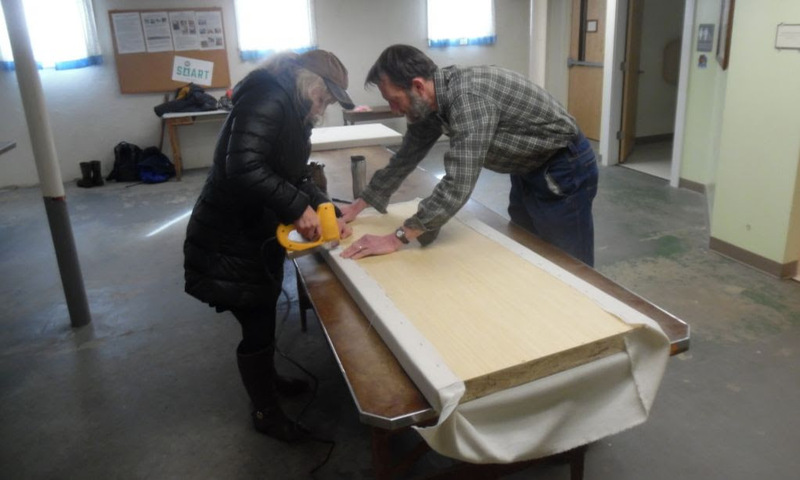 The Acoustic Panel project of the Friends of the Capital City Grange Hall is reported on above; we’ll be interested to see if the Grange meeting and potluck are improved by the panels, as part of our evaluation of the project. So we have quite a few things to be proud of, popular with lots of folks. A small crew of dedicated volunteers keeps the whole enterprise running. We think there is more that can be done! We have room for more people who actively participate in the Grange, in the sense of developing community service projects, maintaining the Grange organization as a running entity, and managing the Hall. We’ll be revisiting these issues, and talking about how we can make real involvement in the Grange more attractive at our meeting on Saturday. Do you have an idea for a project or community service you want to have happen? We can help you–we have facilities, and a pool of interested people like you. We’ll also be talking about ways to structure the Grange meetings themselves to make them more interesting for newcomers, how to allow more time for the interesting programs we like to have, and more. Come and help us continue our quest to be a Grange in the 21st century! Even if you can’t come to the meeting, send me your thoughts, ideas–and complaints. If thinking about the cooking workshop makes you hungry, remember the Community Potluck at 6:00 after the meeting! 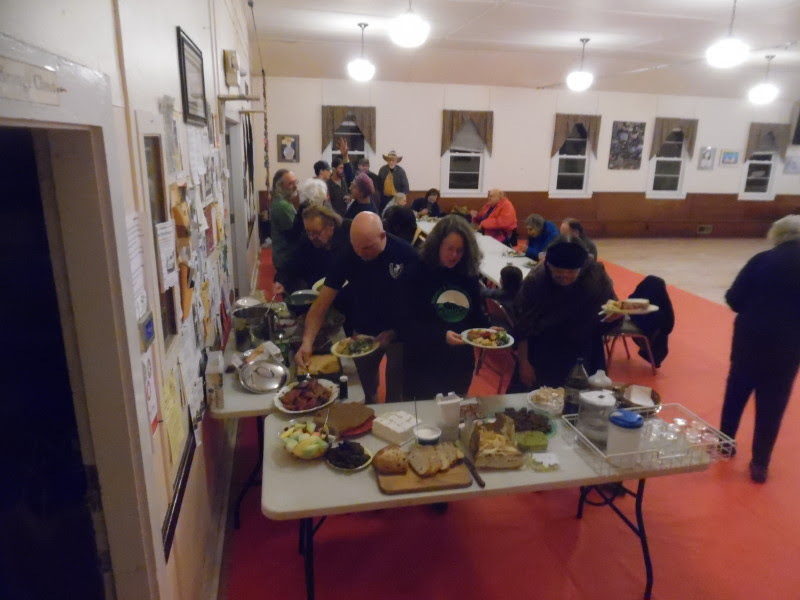 Every month from September to June, we have an open potluck dinner, to which everyone is invited! 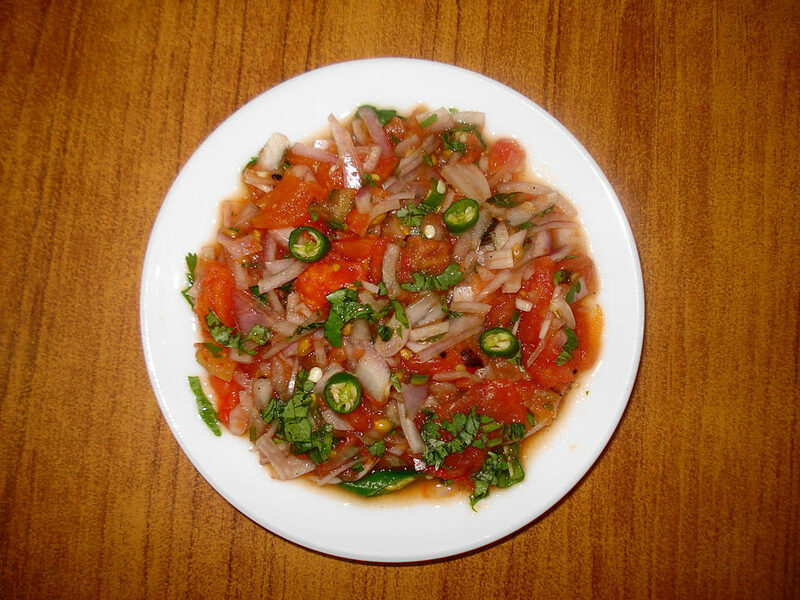 We start about 6:00 PM, and the variety of dishes people bring is wide: green salads, local meats, Indian dals, vegetables, pasta salads and pasta main courses, chicken casseroles, soups, muffins, brownies, cider, sodas, breads and more have appeared–and disappeared! Join us to socialize as well as consume, all are welcome! 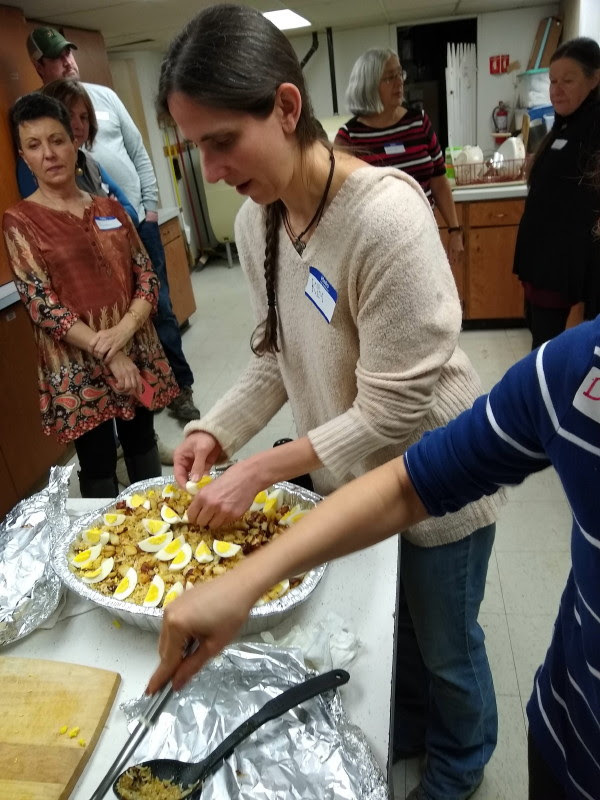 It’s time for the next Indian cooking workshop–March 24 Many of you will remember the cooking workshop that Delna Boyce taught last year. 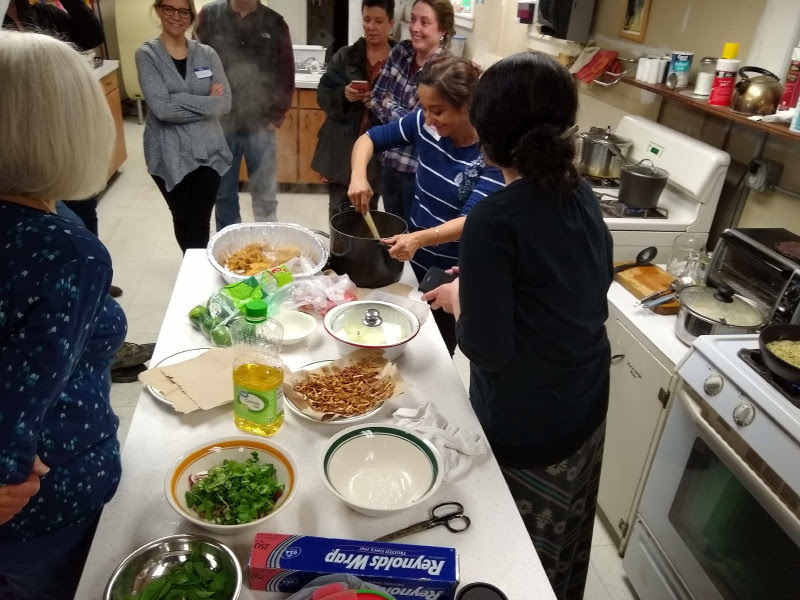 The participants made Parathas, Pakoras, Green Herb Chutney, Aloo Gobi and Mango Lassi, and enjoyed both the cooking and the eating! Delna has joined the Grange, and has offered to teach another workshop. 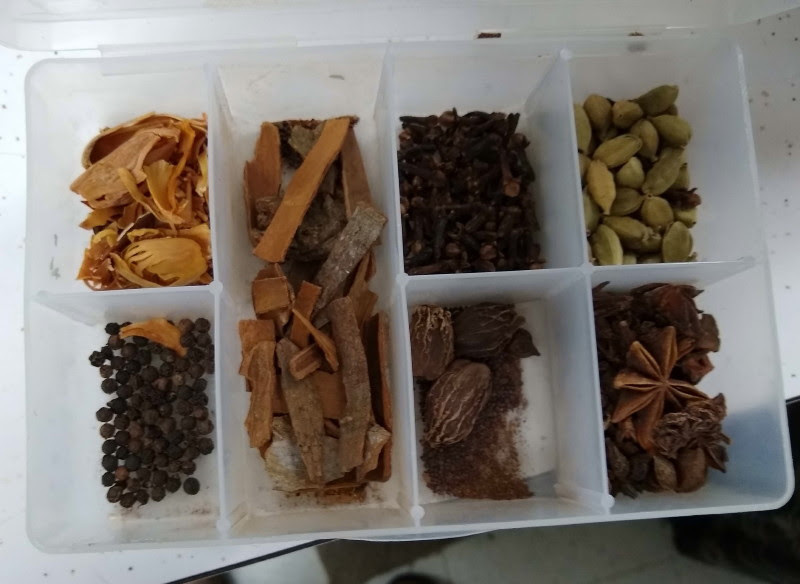 She is calling this “Advanced Traditional Indian Cooking”, and it will focus on making Chicken Biriyani, along with Kachumba salad/relish. The workshop will be from 2:00 to 5:00 on Sunday, March 24th, followed up by a shared dinner for the participants! It’s time to quiet things down a bit–so we’re hanging acoustic panels on the south wall of the Main Hall. And we need some help! 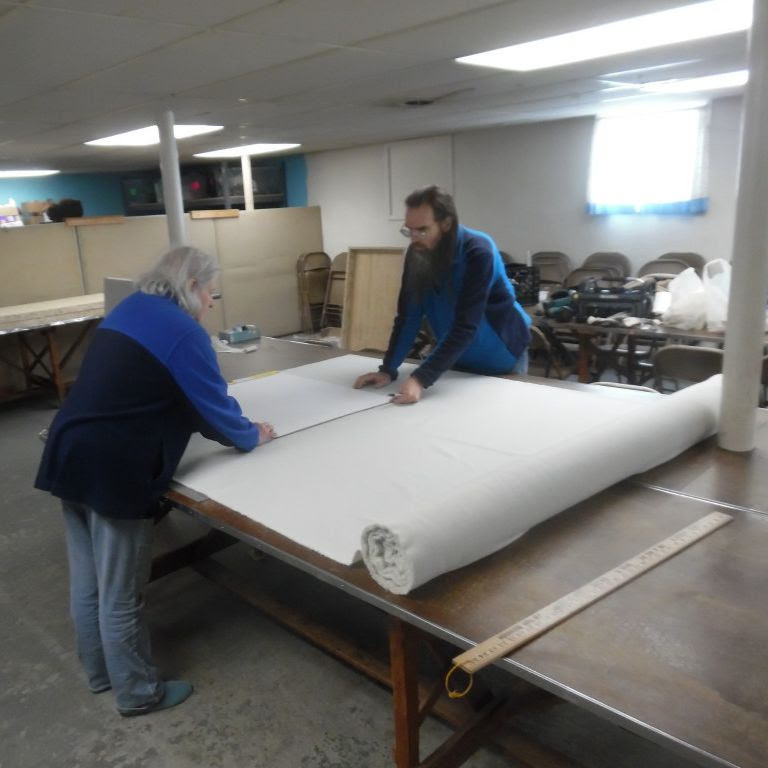 Over the past couple of weeks, the Friends of the Capital City Grange Hall have purchased lumber, acoustic batts and fabric to make 24 panels–2’x 4′ panels. Kurt Giavara and I have made up the frames, and it’s time to install the batts, wrap them with acoustic fabric and hang them on the wall! 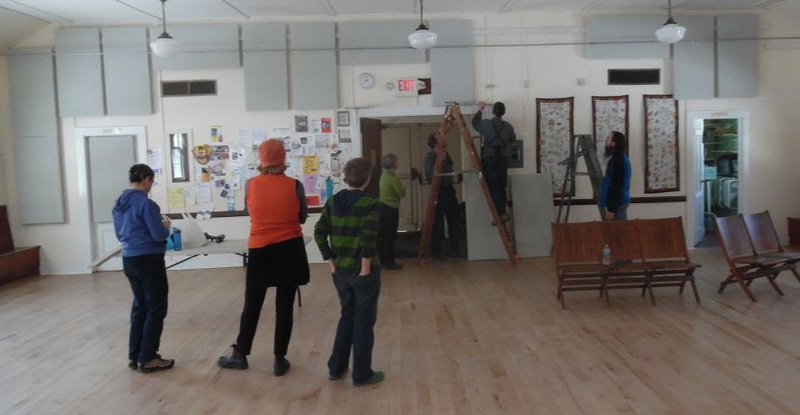 For years, Grange Hall users have had problems hearing each other. 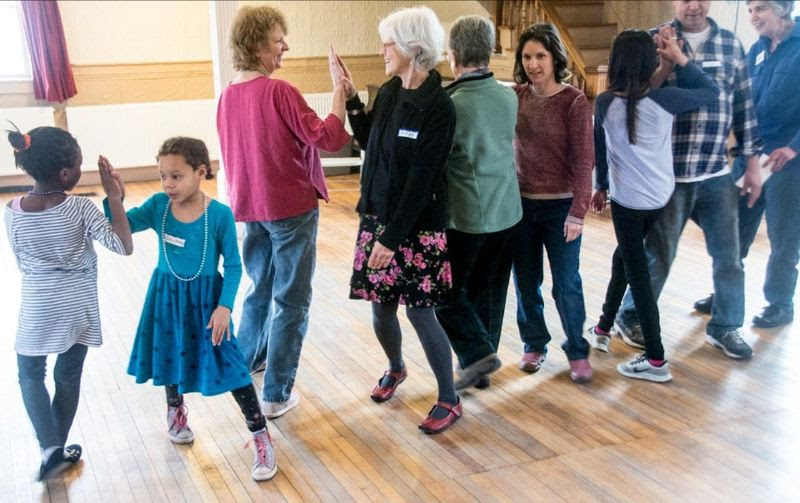 Whether it’s in Grange meetings, rehearsals for the Barre-Tones, contra dance callers talking to dancers–there can be so much “reverb” that it is hard to understand what’s being said. S0–it’s time to do something about it, especially since Grange users have made generous donations to the Friends in the end-of-year fundraising campaign. We’ve decided to start with hanging the 18 panels shown in the drawing above. Putting rockwool acoustic batts in the pre-made frames. Wrapping the frames with acoustically transparent, fire-resistant fabric. 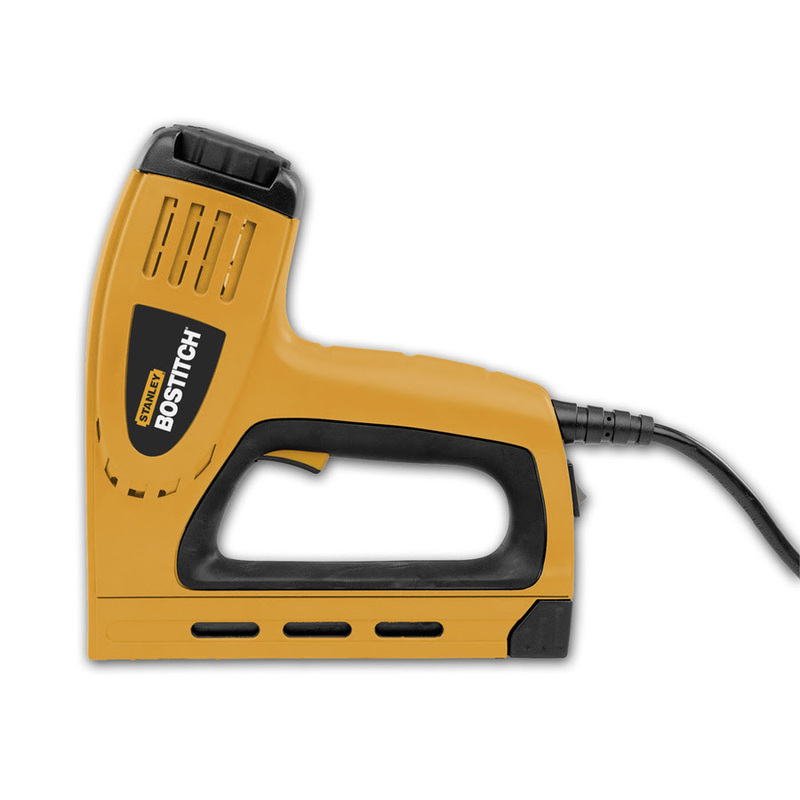 Attaching “french cleats” to the backs–boards with a 45 degree bevel on the bottom edge. Hanging the frames on matching french cleats mounted on the wall, with the beveled edge up. Can you come and help? 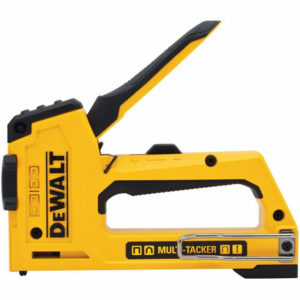 Can you bring a stapler–manual or electric? 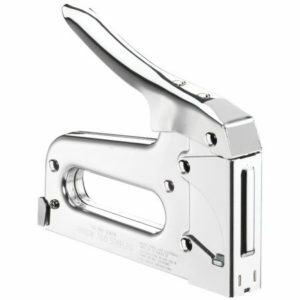 We’re not looking for desk-type staplers, but ones made for stapling, for example, construction plastic and insulation. 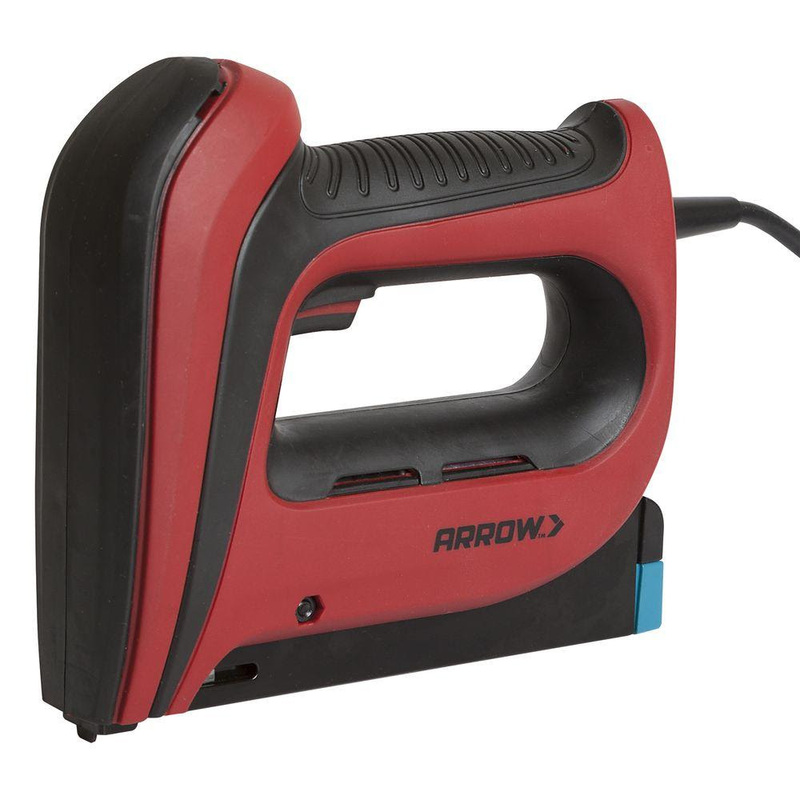 Examples would be the Arrow T50, or Stanley, or other brands like the ones below. If so, we’ll buy staples to match–just let me know the brand! Please contact Tim Swartz if you can come help us on Saturday. “Feedback” has different meanings! When we talk about sound quality, it can mean that nasty squeal from a sound system that sometimes assaults our ears. We don’t want that. un-amplified speech? As at small meetings. vocal music? As at Barre Tones rehearsals. amplified speech with no band? As might be the case at a training meeting. We want to hear–clearly–from you, so let us know what changes you notice. We’d like to hear from a variety of the users; we’ll be getting in touch with various groups, but we want responses from anyone interested in how things sound at the Hall.